Eurovudas Nida 1 Log Cabin: The Eurovudas Nida 1 Log is a garden building design that features contemporary styling including 2 single windows, 1 double window and a large double door all with Georgian style double glazing. 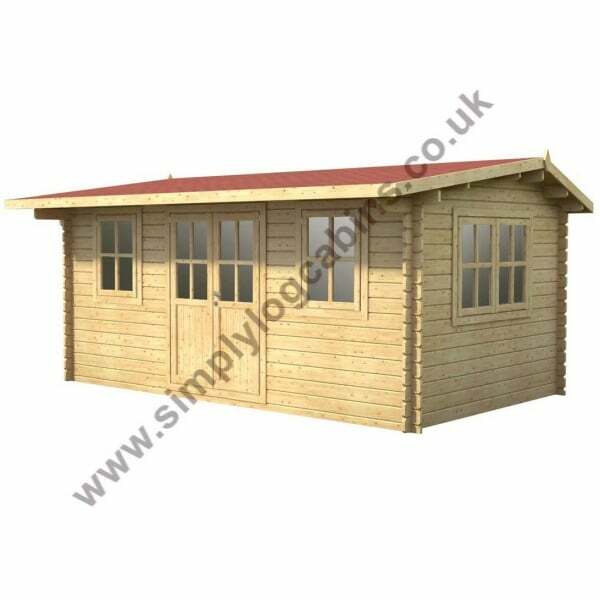 With its 50cm roof canopy to provide shade above the windows this log cabin creates the perfect garden office or leisure room. The bottom of the single windows is sufficiently high so that an office desk can be placed by the window and not interfere with the window operation and such that when viewed from outside the desk top is below the bottom of the window. The 44mm walls along with the double glazing creates a room that can comfortably be heated and used throughout the year. The traditional Nordic build style of this cabin creates an easy to assemble and extremely sturdy structure. The Norland range also feature chalet corner jointing to give that extra timber jointing for extremely good weather resistance.